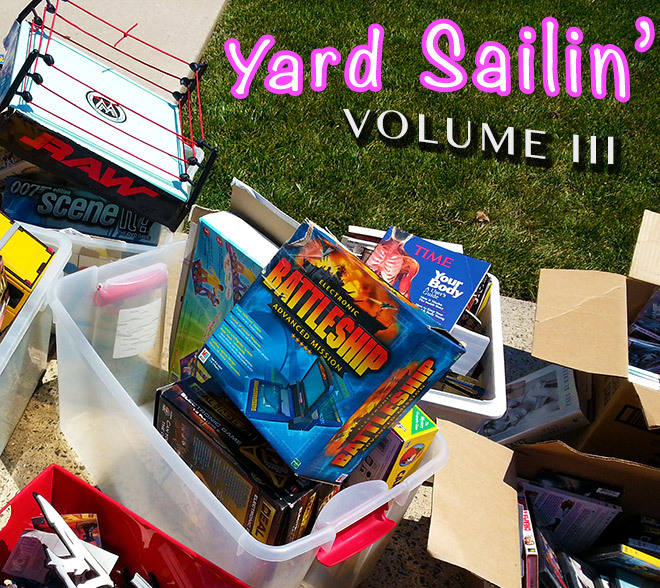 Yard Sailin', Volume III. | Dinosaur Dracula! Another weekend spent shamelessly rummaging through strangers’ trash! We only went to a few yard sales this weekend, owing to a late start and temperatures that could melt steel. Even so, my luck held. This is the third time in a row that I found dusty gold on foreign front lawns. Side story: A yard sale that looked great in the classifieds turned out to be a dud, especially because it required a twenty minute drive. 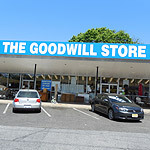 But the guy manning it was this old dude in a wheelchair, and his boundary-crossing verbal asides reminded me so much of my late father, I couldn’t bare to leave without buying something. And that is how we came home with a six-inch ceramic elephant with a chipped tusk. They’re from 1987, which in exaggerated math means that some family waited thirty freakin’ years to finally part with their ALF bedsheets. They’re in great shape, too. I’ve decided to believe that they’ve never been used, I guess because there are few things grosser than buying someone’s old sheets. 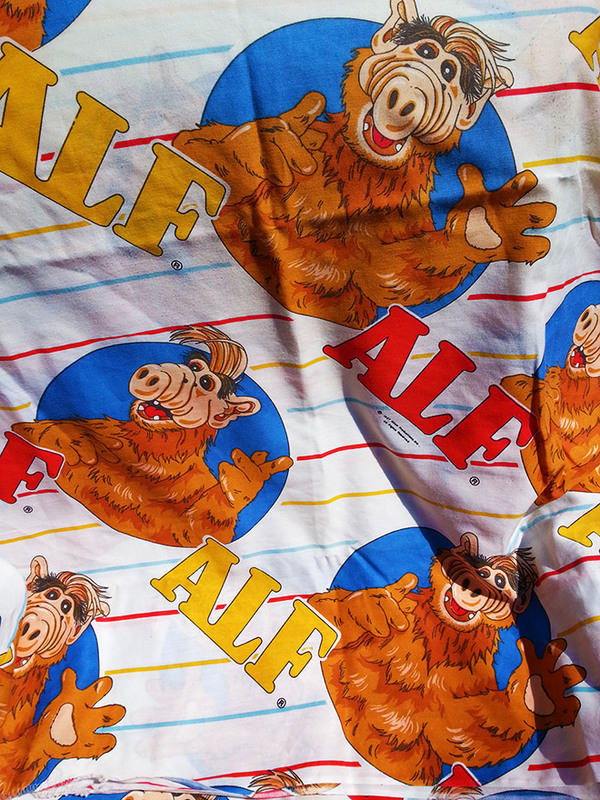 I got both a fitted and flat sheet, which provides just enough material to turn everything into an ALF jumpsuit. Since I have no idea how to sew, it’ll look even more heinous than it sounds. 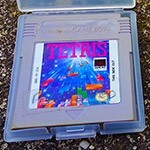 The $2 asking price was a pleasant surprise, because everything else at that particular yard sale was waaay too much. Ten dollars for used board games? Nee, nie, ne. I’m always excited to find these, even if they’re basically worthless. Every special McDonald’s glass seems to have been produced in numbers exceeding thirty billion. I’ve not met a dealer of “old crap” who doesn’t have at least ten of them. Still, five bucks for six glasses was a sweet deal. 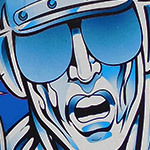 I can’t wait to drink soda from a glass with cop meat painted on it. Of the six I got, these three were the most interesting. 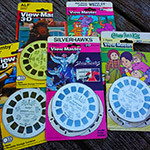 Many of the glasses are from the ‘70s; I know this because the woman running the yard sale told me ten times. 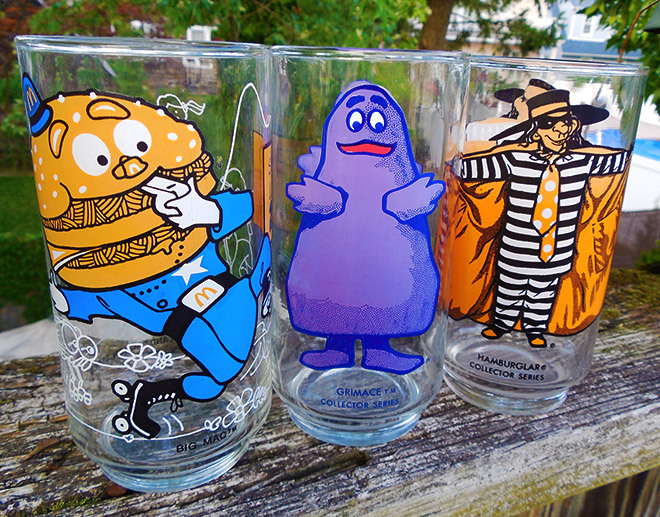 Also: Good Christ, the Hamburglar used to look downright frightening. Like a vagabonding flasher who forgot to strip. 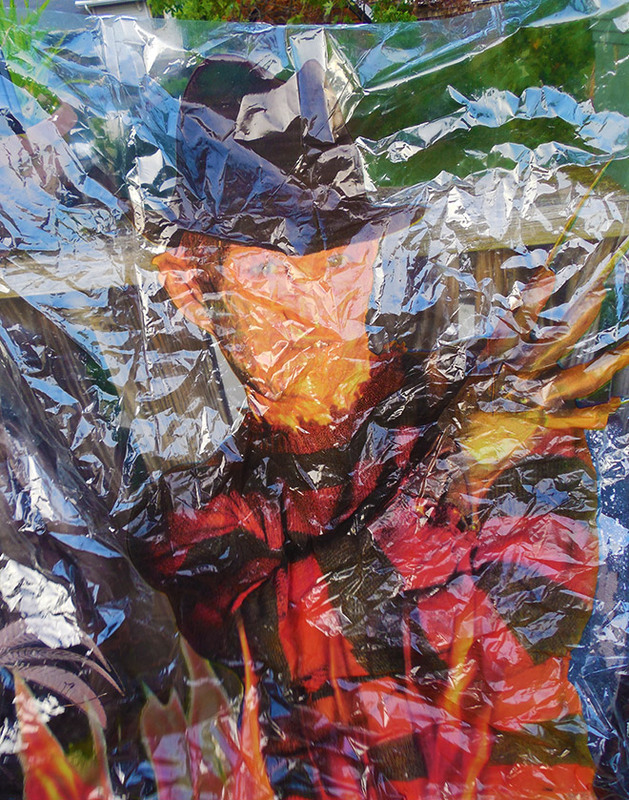 At another yard sale, I spotted this cellophane Halloween decoration — a thin sheet with a nearly life-sized Freddy Krueger printed on it. It isn’t remarkably old; in fact, it’s probably still being made today. I don’t consider any yard sale trip successful if it doesn’t have a subtle hint of Halloween, so I had to buy this. I had to buy this amazingly wrinkled, amazing noisy, amazing large piece of trash. I had to pick this atrocious thing up and carry it past five puzzled strangers, clumsily making my way to the woman who ran the sale. It was brutal. I should’ve just worn a shirt reading “That Guy” in a cursive green font. The pitying seller gave it to me for free. She even threw in a bunch of plastic Halloween tablecloths. Not knowing a more neutral way of saying “yeah I don’t want those, even if they’re free,” I went home with a trunkful of used, crinkly party supplies. I got lucky at one sale, though. 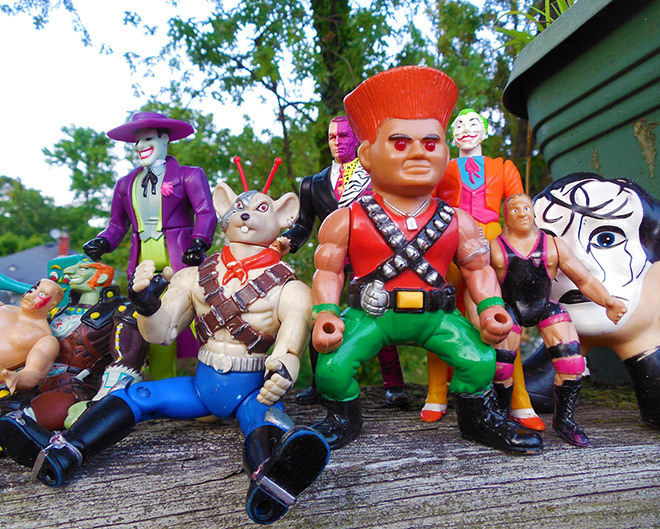 Someone had a bin of “real” action figures from the ‘90s, and while many were duds, I plucked out a nice pile. Two-Face and two Jokers! Owen Hart! Some rat from Biker Mice From Mars! 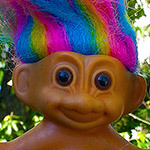 A warrior troll with eyes that no longer light up! Pay special attention to that Sting figure on the far right. 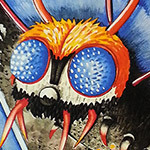 I know he’s a little hard to see, but it’s basically a giant Sting head with excessively tiny hands and legs. It makes no sense. It’s as if Sting’s father was Grand Inquisitor Kray-Tor. I couldn’t leave without him. Annnd now we’re up to the big one. 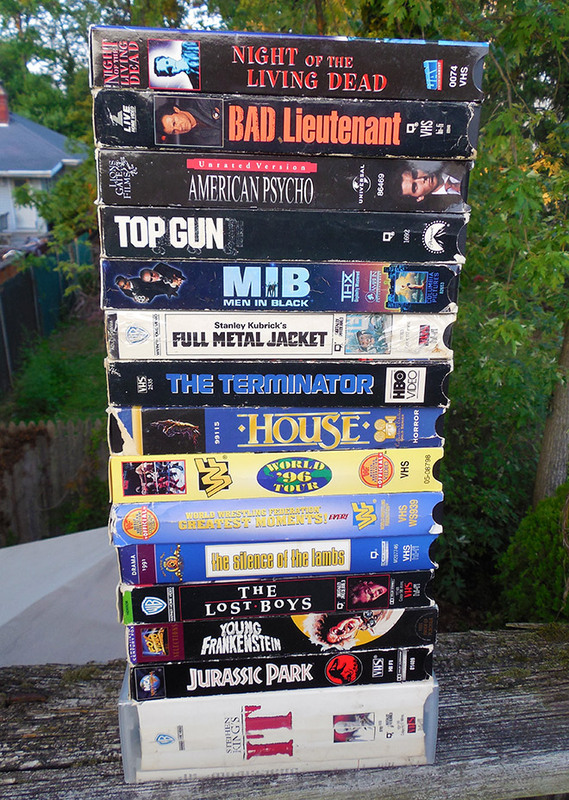 At the very last sale we went to, a family had a huuuuge bin stuffed with old videocassettes. Immediately spotting The Lost Boys, I knew I’d find more treasures in there. 2) House! No, not the TV series — I’m talking about the fantastic 1986 horror movie starring George Wendt and the reanimated corpse of a marlin. The videos that aren’t shown above were even more intriguing. I bought a bunch of tapes that were possibly taped off television. If I’m lucky, I just stumbled upon an absolute goldmine of ancient TV commercials. Overall, I guess I didn’t find anything that warrants skywriting, but I certainly made out well enough to see if my luck continues next Saturday.